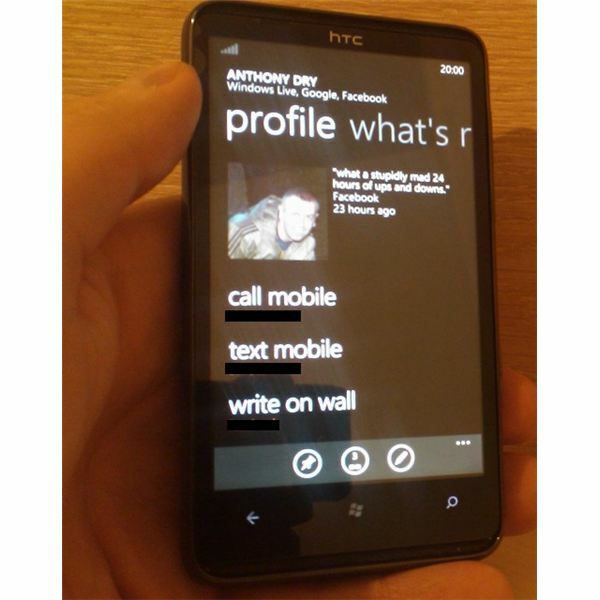 Contact management on Windows Phone 7 can be a tricky business. There are many ways in which you can add contacts to your phone, either by manually adding, importing from SIM card, adding them from a Windows Live account, a Google Mail account or from Facebook. With all of this flexibility, you might expect the task of syncing your Windows Phone 7 to Outlook (for contacts and calendar data) to be easy, but this is not the case. In actual fact, if you don’t use Exchange e-mail, syncing these apparently related systems is much tougher than you might think (Exchange users need only set up their accounts and wait). You can’t use a phone without contacts, so let’s take a look at the various ways in which you can add and sync Windows Phone 7 contacts with Outlook. If you are using a SIM-unlocked Windows Phone (you might have purchased a device from a retailer like Expansys, or manually unlocked the device) then you can copy contacts from a SIM card by inserting the card, powering up and browsing to Settings > Applications > People > Import SIM contacts. In a few moments all contacts from your SIM card will be added to your phone. More contacts can be added by signing into Facebook if you have an account, something that you can do via Settings > Email & accounts > Add an account. If you only want to populate existing contacts with Facebook information (as opposed to adding all Facebook friends to your phone) then use the Settings > Applications > People > Only add Facebook information to existing contacts option. Unlike Windows Mobile 6.x (which allowed synchronization with Microsoft Outlook via ActiveSync or Windows Mobile Device Center), Windows Phone 7 doesn’t have any physical synchronization of contacts with Outlook or any other desktop software. The only form of software synchronization you can achieve with Windows Phone 7 is via Zune, and is restricted to movies, pictures, music and podcasts. So how do you sync Windows Phone 7 to Outlook? Contacts and calendar data can in fact be synced via a Windows Live Hotmail account. Typically this is accessed either via a combination of Microsoft Outlook and Outlook Connector, the Windows Live Mail app or by accessing Windows Live Hotmail in the desktop web browser. Using a Windows Live account with Windows Phone 7 is the only way to access the majority of native services, and contacts can be added to your phone from a Windows Live account by setting up your account on your phone. Any editing of contacts can then be performed on the phone or in your preferred e-mail client. In addition to Windows Live contacts, Facebook contacts and those added to Windows Phone 7 from your SIM card, you can add contact information to your phone from a Google Mail account. Adding a Gmail account is a case of going to Settings > Email & accounts > Add an account > Google. Contacts will be added to your phone automatically from your Gmail account, and will be available for you to select as recipients when composing new e-mail messages.